Trazodone withdrawal can occur whenever someone has been using the drug long enough for dependence to form stops taking medicine. From person to person, Trazodone withdrawal symptoms can vary. This is also true for the Trazodone withdrawal duration. However, it is best that users know what they might experience before they stop the drug and how they can manage the process. What Are The Trazodone Withdrawal Signs And Symptoms? What Is The Trazodone Withdrawal Timeline? How To Prevent Trazodone Withdrawal? What Is The Trazodone Detox Process? What Are The Trazodone Detox Medications? Trazodone withdrawals refer to the body’s response to the sudden absence or decrease of the drug. Is Trazodone habit forming? In most patients, it is not, but physical dependence on the drug is still very much possible. When this occurs, it can trigger a variety of symptoms that are unpleasant for the user, and in some cases may be dangerous. Withdrawal from Trazodone is more likely to occur in individual patients than in others. For example, those who have been taking the Trazodone max dose for an extended period will be at higher risk than those taking a lower dose or taking the drug for less time. The population most likely to have withdrawal from the medication are those engaging in Trazodone recreational use. Can you withdraw from Trazodone safely? Yes, it is possible to do. There are many Trazodone withdrawal success stories. However, it requires that the user recognize the signs and symptoms and get help managing them. There are various reasons why a user might need to stop using Trazodone, from combating addiction to switching medications after the drug stops working. No matter the reason for stopping use, anyone who does stands the risk of experiencing Trazodone withdrawal side effects. None of these signs and symptoms are pleasant. However, some are riskier than others. For example, one of the Trazodone withdrawal symptoms is weight loss. In someone taking the drug to deal with bulimia, this is problematic. But if experienced by someone who suffered from Trazodone and weight gain without needing to increase their body mass, it could be welcomed. Amongst those taking the medication correctly and under the supervision of a doctor, those using Trazodone for depression treatment stand to experience the most painful symptoms. This is because withdrawal symptoms from Trazodone often mimic those of depression. Combined with the fact that depression symptoms will return once the medication is discontinued, these patients need to be carefully monitored when they stop using the drug. The process is most unpredictable in those who have been using the drug recreationally. Since people who do so are often self-medicating, it is possible that ceasing use of the medication will cause everything from Trazodone withdrawal anxiety to seizures and even death. Additionally, the doses taken often exceed what is considered safe. With that said, anyone who is stopping use should seek medical assistance to manage or avoid symptoms. How long does Trazodone withdrawal last? There are numerous variables that can impact the timeline. These include the level of dependence on the drug, the doses taken, and how quickly a given person’s body processes the medication. The half-life for the drug is short, coming in at around seven hours. Within 48 hours of the last dose taken, the drug will have cleared the user’s system (note: Trazodone does show up on drug tests for longer). Days 1-3: The first signs emerge. Days 4-5: The most intense symptoms are felt. Days 6-7: The intensity of the symptoms begin to fade. Weeks 1-4: Symptoms persist but steadily weaken until they are gone. The method a person uses to stop taking the drug can impact how long withdrawal from Trazodone will last. Those who quit cold turkey tend to feel the most severe symptoms but may shave a few days off the overall timeline. Those who opt for tapering their dose and whose doctor has a plan for switching to another medication may barely notice symptoms of withdrawal, though the process could take longer than going cold turkey. It is important to note that if the user is taking the medication with other substances, the withdrawal process and timeline becomes unpredictable. For example, if the user is drinking on Trazodone, the withdrawal process is more likely to be severe, long-lasting, and even deadly. Anyone using the medication with other substances should seek medical assistance in withdrawing. Working with a doctor to create a tapering schedule, steadily reducing the dose taken until the medication is no longer being used. Having the doctor select another medicine to switch to which does not have dangerous interactions with Trazodone. Doing things to stay healthy and active, such as hydrating well, eating nutritious foods, and exercising. Attending regular therapy sessions to address the mental aspects that can arise from withdrawal, such as cravings and anxiety. Taking part in a supervised detox program tailored to getting off SSRIs. However, even if the user does everything right, they may still have to ride out the Trazodone withdrawal schedule and the effects that come with it. Trazodone detox is when a patient works with medical staff to safely cleanse their body of the drug and the lingering effects of its use. At its most basic, this can involve nothing more than a tapering schedule and a diet and exercise regimen. The chosen tapering schedule will depend on how long the user has been taking the medication, the doses taken, and how they were using it. In some cases, the tapering schedule is just one month from start to finish. In others, it can last several months. In cases where the user is experiencing severe withdrawal, the detox process must be more controlled. When this happens, the detox process will occur in a residential treatment facility. There, medications that treat withdrawal symptoms can be used at the same time tapering is taking place. The staff will closely monitor vital signs to make sure the patient is safe throughout the process. Once with the worst part of the withdrawal process is over, the patient can then switch to outpatient treatment for the rest of their detox. There are no specific medications that must be used during the detox process. 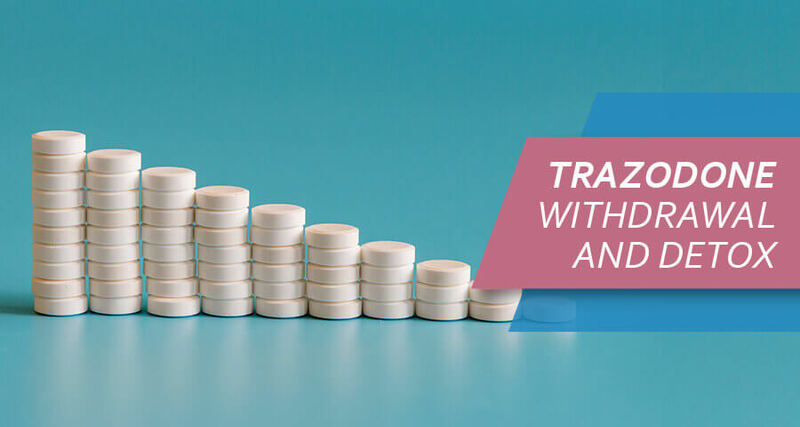 Because of the Trazodone antidepressant properties, it is common for doctors to switch patients to another antidepressant as a method of cutting the withdrawal process short. However, if SSRIs, in general, are no longer working for the patient, they will need to wait at least two weeks between stopping the medication and starting a new medicine. While medicines like Trazodone and Zoloft are compatible, SSRIs and MAOIs are not. Often, no detox medications are used. Instead, the treatment team relies on tapering and treating withdrawal symptoms as they arise. It is vital that the patient works with an experienced team of medical professionals so they can get treatment that is tailored to their needs. Anyone who is wanting to stop taking Trazodone and wishes to avoid harsh withdrawal symptoms should work with drug abuse medical professionals. While it is possible to stop use by going cold turkey, it is not advisable. Drug rehabilitation centers can offer the assistance needed to get clean without feeling miserable.